If you are interested in new approaches to business leadership that are transforming the world, then you would struggle to find a better book than this one. My work in business vision and values led me to spend time in Zappos head office in Las Vegas in August 2016 where I found myself dragging my jaw along the floor as I walked around their buildings. I have been wanting to review this book ever since as I have seen the reality behind the words. I would highly recommend the audio version of this book, because it is read by the author himself – Zappos CEO Tony Hsieh (pronounced ‘Shay’) with small but very significant contributions read by other members of the ‘Zappos family’. In 2009 Zappos became the world’s first billion-dollar on-line shoe store, less than 10 years earlier Zappos consisted of a few people working out of a loft space in Tony Hsieh’s apartment. Tony Hsieh shares how his team has built a business where the absolute primary driver for all key decisions is not ‘What will make us the most money?’ but instead ‘What will create the greatest culture for us and all of our stakeholders?’. For the vast majority of business leaders, vision, purpose, values and culture are treated like a ‘box ticking exercise’. At Zappos under Tony Hsieh’s leadership these matters are central to every choice taken and every activity conducted in their business. Tony and his team have created a culture that is all about culture! Take it from me, when you visit Zappos’ offices it is a ‘jaw dropping’ experience, I have so many stories and great memories from my time there that I don’t have time to share here. What I would say though is that some of the key reasons behind many of the remarkable activities and business structures, that I observed in Zappos, are described by Tony in this book. You don’t find too many people wearing suits and ties in Zappos, it would not bother anyone if you do wear a suit, but it does not really fit in with their core values. 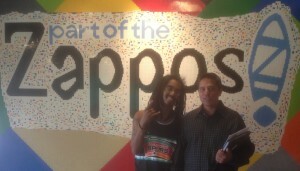 I spent a whole afternoon with one of Zappos lead storytellers Jovahn, a casually dressed Rastafarian with a big smile (in the photo with me). Jovahn is one of Zappos’ ‘Lead Storytellers’. He writes and shares compelling, interesting stories about Zappos through various on-line mediums. Those stories generate interest in the business and create new customers, but there is no ‘marketing department’ in the traditional sense. The underlying systems and structures on which the vast majority of businesses have been built and are still being built on, are hugely inefficient in terms of BOTH the long-term financial well being of businesses AND the long-term personal health and wellbeing of their team members and other stakeholders. Zappos has 10 core values that are at the heart of all activities across the business. These values are written on the walls as you walk around their buildings, they are on each team members security card – see the below picture of Laura’s card that I took whilst I was there. Zappos have adopted a structure known as ‘Holacracy’ that turns the entire traditional business structure on it’s head. Holacracy does away with the traditional ‘command control’ hierachical structure found globally in 99.9% of medium and large businesses, in fact it does away with whole swathes of management layers. Management is completely decentralised and people who are best placed to make decisions are empowered to do so. Holacracy was created by another very successful innovative business leader and entrepreneur called Brian Robertson who’s book called ‘Holacracy’ I will be reviewing next month … so watch this space and I will share some insights about Holacracy. Tony Hsieh explains in this book how his approach to ‘living core values’. These are not just words, it is what I witnessed when I was at their offices. 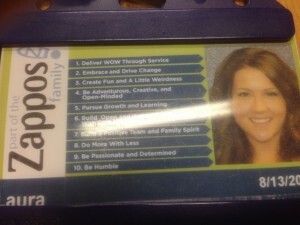 The photo below is that of Laura one of the ‘Zappos family’ who made me feel so at home whilst I was at their offices. You can see that the companies 10 core values are on Laura’s card and every other staff card. These same 10 values are on the walls around their offices and these values are part of the everyday conversations I heard around the building. When I asked Laura if all Zappos employees would know these values she smiled and said “Why don’t you ask them?”. During my time there I asked several individuals of the ‘Zappos family’ including the Zappos driver who drove me to my hotel and I can confirm that they did not just ‘know’ all 10 of these values they demonstrated these values in all of my interactions with them. Whilst I spent time in Zappos Customer Services Support Desk area, I discovered that everyone in the business works for at least 10 days a year answering the phone to customers, including the CEO (Tony) and anyone else from Accountants to IT computer programmers. This policy keeps everyone connected with their first core value ‘to deliver wow through service’. Whilst listening in on a call I heard a returning Zappos customer who rang up cheerfully saying ‘I would like some help with ordering my happy shoes’. This attitude sums up what is the most values aware and values driven large organisation that I have ever encountered. Several members of the Zappos team I spoke with confirmed what Tony states in the book about how they hire people based on them being a values match, their qualifications and experience are secondary factors. Even when they interview someone who they know will add significant financial value to their business, they will not hire them if they are not also a ‘values match’. Zappos was featured in Fortune Magazine’s top 25 businesses in the world to work for, at the same time being one of the top financially performing company’s in it’s sector. Tony has consistently described their vision as “Delivering happiness to it’s employees, customers & vendors … and to the world.” hence the title of his best-selling book ‘Delivering Happiness’. Many of you reading this blog will have been to one of my Spiral Dynamics talks and will be aware of the 8 levels of human consciousness uncovered by the scientist Dr Clare W Graves in the 1970s and 1980s, that was famously used by Nelson Mandela and Desmond Tutu to structure the South African reconciliation process throughout the 1990s. Tony Hsieh is one of several emerging level 7 leaders of medium and large businesses in the world. The vast majority of business leaders (over 95%) operate primarily at levels 4,5 and 6. My best guess would be that ‘Awareness Level 7 Thought Leaders’ currently make up less than 3 percent of the world’s business leaders. 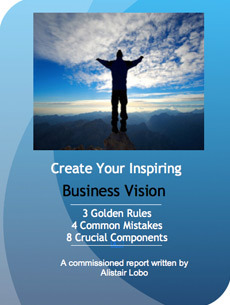 They are however relatively easy to spot because one of the give-away signals, which is … ‘Level 7 business leaders are able to see how a business with a greater purpose and greater levels of inspiration will synonymously achieve greater profits as an automatic ‘bi-product’ (of delivering this greater purpose)’. Intellectually understanding the equation ‘greater purpose equals greater profits’ is one thing, living it and converting it into reality can only be done at a with a more complex level of consciousness awareness which the vast majority of business leaders do not yet demonstrate. My mission is very much about transforming this reality. In my research there are no large or even medium sized Level 8 led businesses to be found in this world, however, there are a handful of level 8 business leaders of small businesses emerging. A level 8 business would not have a vision such as ‘delivering happiness’ as it is a thinking system structured on the recognition of equalising pairs of opposites (e.g happiness & sadness). Right now I am as foucsed on helping level 5 and 6 business leaders move to level 7. I am also helping some level 7 leaders expand their level 7 thinking pushing into level 8 thinking. But this is more of an ‘evolutionary process’ rather than a ‘revolutionary process’. If you want to know more about the Spiral Dynamics based Levels of Leadership – please watch this space over the next year. When Zappos was sold to Amazon in 2009, there was a lot of negative press that they had somehow ‘sold out’. The reality is that they are a wholly owned subsidiary of Amazon. In fact if you read the book you will understand why Tony, Fred and Alfred’s concerns to preserve the cultural leadership of the business from the potential threat of other investors on their board that led them to agree the Amazon deal in order to best preserve the core values of their business. I do a lot of values work with businesses, the attitude of many business leaders is to treat ‘business values’ as a box ticking exercise.